"Well known to most 356 Porsche lovers, Charlie White has been a Porsche Uber-enthusiast for 45 years. His literature website is an encyclopedic reference source on all printed things having to do with Porsche in the 356 era and later. He is one of the world's leading collectors of 356 Lit, but beyond just accumulating pieces, he has spent decades sharing his ever-growing knowledge base with other enthusiasts. He has helped to define the genre and its subgroups extending to such arcane areas as calendar coins and radio brochures. Charlie recently published a book that distills much of this accumulated information into 356 color pages. For the last few years he has maintained an on-line database of literature sale prices with commentary, and warnings about fakes, that provides an excellent overview for anyone new, or even experienced, in the market." Gordon Maltby, Editor, 356 Registry Magazine. "Nowhere else will you find more obscure but useful information! Charlie White has made a huge contribution and this book should join the other basic, required books on your Porsche bookshelf." Bill Block, Reviews Editor, 356 Registry Magazine. "It arrived, many thanks! Thank you so much for the very nice inscription! WOW! Charlie, how in the world did you put this book together? It is flat out fantastic. Did a publisher do all this for you? I am really impressed, thank you so much for doing this for all the rest of us. The book is just great and certainly you can quote me! I love the big type for old farts like us! Plus your highly knowledgeable comments throughout the text are like taking an advanced class in various topics at a Porsche Graduate School. Great for you to do it but better for us. Thanks again, I want to buy anything you publish!" Jim Schrager, Market Watch Editor, 356 Registry Magazine, and author of "Buying, Driving & Enjoying the Porsche 911 & 912, 1965-1973". "BTW just received your new Sales and Technical Literature book and highly recommend to all! Excellent and informative! Certainly Charlie, I think this is the best work of this type yet. No need to make comparisons or mention any names but I like it much better……! ", Tim Herman, Carreramotorsport.com. "Late yesterday, I received your Wonderful new book. The personal note you wrote to me….along with the Dedication page...…just about brought Laurie and I to tears! It is one of the highest moments in my Porsche 356 experience. Also knowing you and still learning something new about the Porsche 356 after all these many years." Bob Raucher, Porsche Enthusiast Extraordinaire! "To all my Porsche friends. Here is a new book you can not do without, especially if you are into 356's. This is worth putting in your club newsletter too." Susann Miller, Co-author: "Porsche: Brochures & Sales Literature A Source Book, 1948-1965". "Just received my signed copy. Here's to say "Thank You" and "Kudos" for an amazing publication! It's a MUST HAVE for any 356 library ... an absolute bargain at the price!" Jim Roten. "Really liked your website and I think your book is the right Christmas present for my boyfriend! He already restored a 356 B T-5 and now has a new "project" a 356-A Coupe. I think he really needs your book... :-) I'm just wondering about the time it will take to Germany. Do you know, if it's possible to reach me before Christmas? Where I can send the money to? Thanks in advance and greetings!" Claudia Grillenberger, Germany. "I received your new book in the mail yesterday - started reading it last night and it is terrific! ", Bill Coghlan. "Hi Charlie! The BOOK arrived in the post today. Stunning! Congratulations to you on a fine piece of work!" Regards, John Lambie. "Your book arrived today, that was quick! And the book is absolutely gorgeous, and autographed too! Thank you so very much for creating such a work of art. I'm sure my dad (and I) will love it. If there is anything I can do to help you promote your book please let me know." Sincerely, Phil Ballou. "The book arrived today, thank you!" Best Regards, Martin Woldinga, Netherlands. "Hi Charlie, Can I order your book and pay with Paypal? Being based in Geneva Switzerland, it's the simplest way to pay you." Thomas Seydoux, Switzerland. "Thanks for the book. Came in today's post. It's fantastic!! THANKS", Jon Finkelstein. "Hi Charlie! Please hold one book for me, check is in the mail tomorrow morning! Thanks", Arnie Fried. "Is your Literature book sold out? I would like to get one, Thanks," Bob Hodgin. "Hello Charlie! Just found your website and would love to buy your book - just wanted to make sure it's available - thanks!" "We want order one of your book Porsche Sales & Technical Literature...The Book. About my payment please tell me how we will pay, if possible with banking transfer. Thank you in advance. Best Regards", Ermanno Cattaneo, Italy. "CHARLIE, I GOT MY NEW LITERATURE BOOK TODAY! ITS GREAT, SOON I WILL KNOW ABOUT 25,000 MORE THINGS ABOUT 356's! THANKS FOR THE AUTOGRAPHED COPY!" MICHAEL BANCHERO. "To All & especially Charlie White! 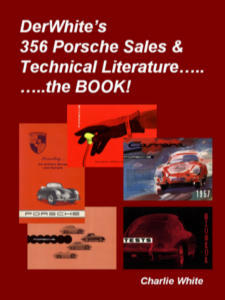 Just received DerWhite's 356 PORSCHE SALES & TECHNICAL LITERATURE.....the BOOK ABSOLUTELY, ABSOLUTELY, ABSOLUTELY, PHENOMENAL! What a great undertaking! Thank you Charlie! I can't put it down! It's 12:06 AM in Florida, my wife is calling, nicely, at this point, WHEN ARE YOU COMING TO BED, DEAR? THIS WILL GET LOUDER SOON AND THE DEAR WILL BE GONE, GONE, GONE! GOOD NITE!" ARNIE, Ft. Lauderdale. "I speak english not so good. I want to buy your Porsche book. Can I pay with Paypal? Best regards", Walter Traxler. "I just received the book. I must say I am very pleased! ", John (jk@msn.com). "Your book arrived today. Outstanding work! I would recommend this book to anyone who has an interest in the 356 model Porsche." Terry Shenberger. "If you liked my website, you'll love my book!!"